Cigarette advertising and marketing have been restricted since the 1960s – first through a tobacco-industry code, and then by federal laws, and agreements between the tobacco industry and the states. But the growing use of digital media, especially among young people, raises questions about whether those advances are being undercut by user-generated videos promoting cigarettes on largely unregulated internet sites such as YouTube. A new study finds that it is possible to counteract such pro-tobacco YouTube videos by showing viewers a corrective message that describes the severity and scope of health risks associated with smoking. The study, published online in Journal of Health Communication on March 17, was conducted over the internet with 999 adolescents ages 15 to 19 by researchers at the Annenberg Public Policy Center at the University of Pennsylvania. The participants, including both smokers and non-smokers, were assigned at random to one of two groups. 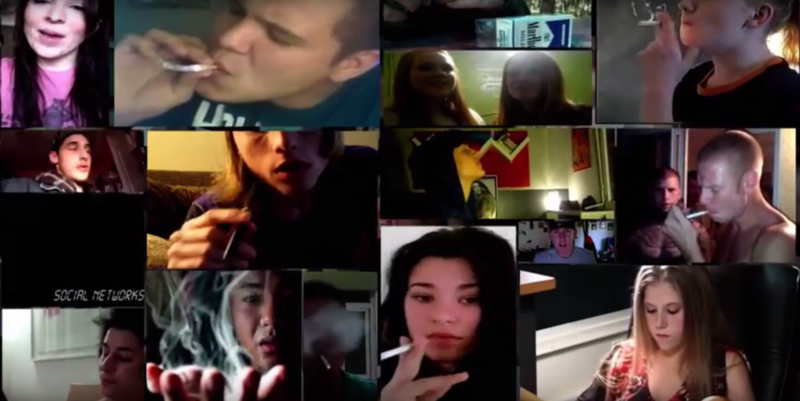 One group saw a 43-second video which featured a mosaic of user-generated YouTube videos showing adolescents smoking followed by a health message emphasizing the dangers of smoking to those individuals. The other group watched a 60-second video that was unrelated to smoking (on cooking salmon). Montage of pro-tobacco YouTube videos used in study. The group that saw the video showing adolescents smoking “held stronger beliefs about smoking’s negative health consequences, less favorable attitudes toward the behavior, and less favorable perceptions of its social acceptability,” the researchers found. Showing adolescents a video that highlights peers engaged in undesirable behavior such as drug use can backfire, the researchers said, by making the drug seem more alluring and commonplace. But the study found that judgments about the social acceptability of this behavior – which is known in social science as an injunctive norm – were changed in the group that viewed the anti-smoking message, despite the fact that the group also saw examples of many peers smoking. Although the researchers did not directly test the use of corrective messages placed alongside actual problematic YouTube videos in a real-world setting, the findings suggest that such health messages could be used in this setting to counteract peer modeling of smoking on social media sites, noted a study coauthor, Patrick Jamieson, the director of APPC’s Adolescent Health and Risk Communication Institute. The internet survey was administered by the research firm SSRS, and the research was supported by the National Cancer Institute of the National Institutes of Health (NIH) and FDA Center for Tobacco Products. The content is solely the responsibility of the authors and does not necessarily represent the official views of the NIH or FDA. Besides Romer and Jamieson, the researchers on this study were APPC Director Kathleen Hall Jamieson, former APPC postdoctoral fellow Chris Jones, and Susan Sherr of SSRS. The video montage used in the study was created by APPC writer/producer Daniel Corkery and designer/content manager Zachary Reese. To download the paper, click here. To download the news release, click here.